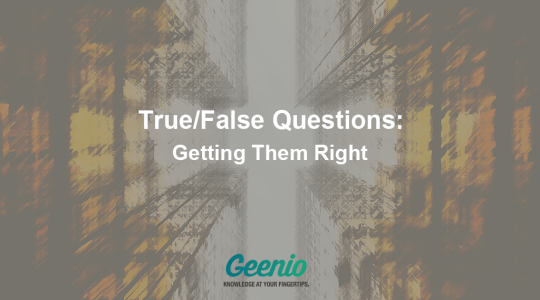 True/false questions are favored by educators first and foremost because they take little time to construct, but also due to the fact that tests comprising of such questions are very easy to grade. Many see the results obtained with the help of true/false questions as dubious because of the high probability of a learner guessing the correct answer. However, in fact, the chances of getting a passing grade while relying purely on guesswork are slim, provided that the test contains a sufficient number of questions. Like with other concretized questions, answers to true/false questions are harder to guess correctly than those to multiple choice questions. This being said, course authors often do true/false questions a disservice by not putting any effort into constructing them. In addition, incorrect answers to true/false questions give no indication as to what knowledge the learner is missing and the reason they have answered incorrectly. Enable you to cover a wide area of knowledge. Can be constructed out of a few words, which makes them less dependent on the learner’s ability to read carefully. Take very little time to be answered. On average, a learner can answer 3-4 true/false questions per minute. Assist learners in acquiring and retaining new information. Care must be taken as to not make the questions too simplistic. It is hard to accurately gauge a learner’s actual understanding of the material judging by the results of a test composed of true/false questions. Learners have a 50% chance to guess the correct answer to every individual true/false question. A test containing nothing but true/false questions has to contain a significant number of them for the results of the test to be relevant. True/false questions are very handy when you need to check whether learners hold any misconceptions about the material or misunderstand it. Make sure that the questions cover every key point of the material, and the lack of understanding of specific areas of knowledge will be plain to see. State your questions as clearly and unambiguously as possible. Keep your questions short and to the point. Never try to cover multiple ideas or notions with a single true/false question. Every question must present itself as a statement that is unequivocally true or false, and that does not allow any exceptions. Avoid using negative constructions in questions. Common misconceptions make fine true/false questions (example: “The Great Wall of China is the only human-made object visible from the Moon: true or false?”). Use them to check the learners’ understanding of the material. Construct your questions in such a way as to make incorrect answers appear more tempting to learners who do not know the correct answer. Randomize the order in which questions based on true or false statements are presented. Do not introduce ambiguity to your questions by using words such as “sometimes”, “the majority”, “most likely”, “some”, “usually not”, “best”, “worst”, etc. Monarchy - a form of government based upon the principle of collective decision making. True/false questions is the most common question type, and it is widely used in testing. Such questions are the easiest to construct, but at the same time present the most potential pitfalls that must be avoided. Learners can spot patterns in the way questions are constructed and guess the correct answers based on the questions’ grammatical makeup and other indirect hints. Motivate the learners to further study the material. Help refresh the principal information delivered in earlier lessons or courses. Serve as a basis for discussion regarding the points of contention in the material. Keep in mind that every question type has its own strengths and weaknesses, and that none is ideal. By following the best practices, you can improve your tests and make them more effective. Take the best every question type has to offer, use their strong suits and avoid their drawbacks - and you will see the effectiveness of your tests and the accuracy of their results skyrocket.